RAM, two shear or over. EWE, two year and over that has reared lamb/lambs in 2016. 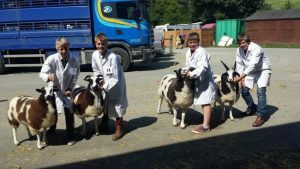 Although they were only showing lambs this year, Wyn and Siwan Harries and daughters Sara and Lois, made a substantial impact on the Royal Welsh Show results. 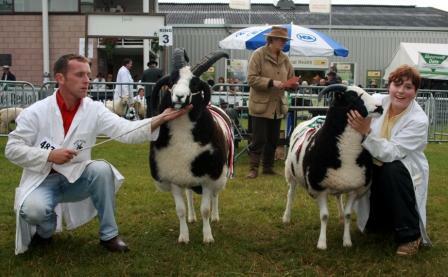 Two-horners were the most numerous in the show by far, but it was four-horned sheep that won three of the four main championships. 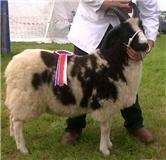 A Hope gimmer lamb won the overall championship and a ram lamb, the reserve male championship. And for good measure the male champion shown by Robert… Price, was also Hope-bred. On a sweltering hot day, judge Gavin Haworth had some cracking sheep in front of him, not least in the shearling ewe and tup lamb classes. 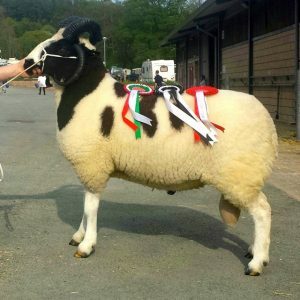 His choice for overall champion was a Hope gimmer lamb by the home-bred Hope Rocky Boy, and from a female line that goes back to a Deerpark ewe which Wyn says has produced some nice sheep for them, including the lamb’s mother which was Reserve Supreme champion at the Welsh a few years ago. The reserve overall champion was Churchstoke, Powys breeder Robert Price’s Hope Flash Lad which he bought as a lamb at last year’s Scottish Region sale and which recently took the top male ticket at the Three Counties. The reserve female champion at the Welsh was an extremely fit two-horned ewe from Ryan Edwards, Stockton-on-Teme, Worcester , which won at Great Yorkshire last year as a shearling. 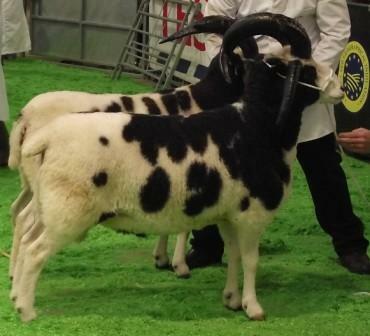 It is by Highclere Lighting, the ram which had also produced Ryan’s 2014 Worcester sale champion. The reserve male champion at Builth Wells this week was a stylish, well grown lamb by the Harries’ highly successful Hyndshaw Highland Laddie. The lamb will be coming under the hammer at St Boswells in August. 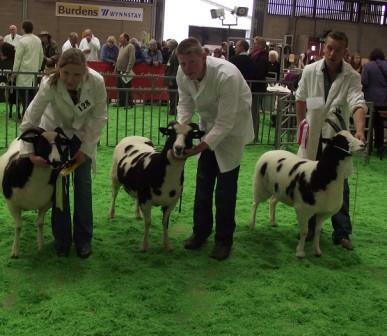 Harries ram lambs also stood third and fourth, with one from Robert Price standing second. In the other classes, the big two-horned Border Windrush bred by Clive Richardson and now in the hands of local breeder Rhodri Jones, won a line-up of three senior rams. 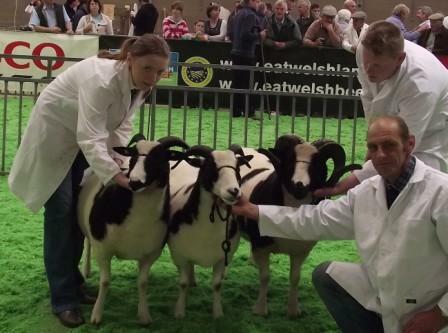 Two smart two-horned shearling ewes from the Trumper family, Abergavenny, won first and second in class, and both were by Windrush, the first prize winner having headed the shearlings and taken the reserve female champion at this year’s Three Counties. Only two groups-of-three turned out with the Trumpers taking first and Rhodri Jones, second. Thank You to This Years Judges Howard Walsh and Gavin Haworth from Yorkshire for taking time to Travel around Wales to Judge the Competition. Well done to the Members who took Part. Best ram used this season. 1st Rhodri Jones 2nd Richards Family 3rd Trumper Family 4th Paul Cheetham..
1st Rhodri Jones 2nd Sally Amoore 3rd Thomas Banning 4th Paul Cheetham. 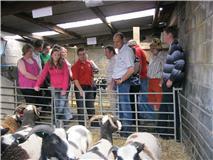 Wales Region Official Show and Sale at Llandovery Market was held on the 27th of September. 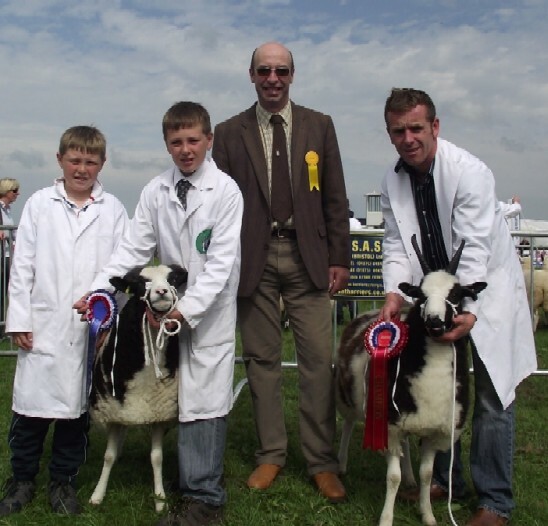 Pictured Judge Gareth Jones with the Show Champion (left) Went to Mrs DJ Price with a Ram Lamb Pentrenant Dice and Reserve went to Mr R Price with a two year old Ram Hope Commando. Sale Top Price Was Myrddin Glyn (Bred by Richards & co ) From Arwel Jones who Sold for 600 gns. 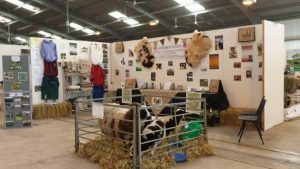 Award for the Best Sheep Trade Stand went to our Jacob Stand this Year. Another Well supported Show. 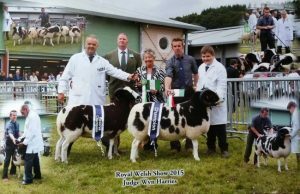 This Years Show was Judged by Wyn Harries he awarded his Champion this year to Rhodri Jones’s Aged Ram Border Windrush, And Reserve Champion again to Rhodri Jones with a Shearling Ewe. Best Shepherd Award this Year Went to Owain Jenkins, And well done to Owain for Winning Reserve Place for the Shepherds Competition against all the other Sheep exhibitors at the show..
EWE, two year and over that has reared lamb/lambs in 2015. 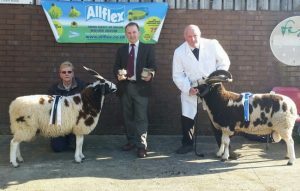 TWO Welsh flocks grabbed the headlines in the Jacob Sheep Society’s Wales Region show and sale in Llandovery which had several new buyers among the top bidders. 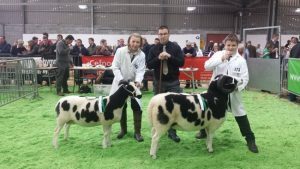 Hope flock owners Wyn and Siwan Harries (Llandeilo) saw judge Nicola Fletcher tap out their ram lambs for both the overall and reserve championships while Beiliau fl…ock owners Lydon Trumper and Family (Abergavenny) picked up several of the top prizes – and prices – in the female classes. Sale topper on price at 700gns was the champion, the Harries’ four-horned tup lamb Hope Lucky Jac, a January triplet out of their successful sire Hyndshaw Highland Laddie which of course won the Royal Welsh this year. 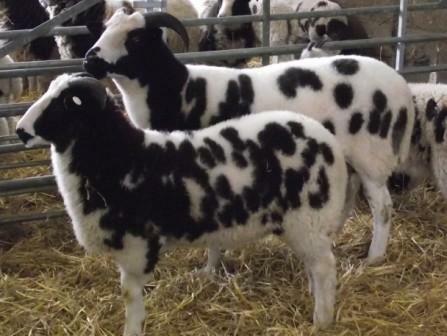 The lamb was out of a Pentrenant Domino-sired Pencaedu ewe and sold to Messrs Lewis, Llandovery. Another Highland Laddie son, Hope Young Star, stood reserve and went on to make 300gns. A four horned February twin, it is out of a home-bred Hyndshaw Flash ewe and went to young new member R. Jones, Llanbedrog, Pwllheli. The same buyer made two bids of 420gns to claim the Trumpers’ first and second prize shearling ewes. First was an Elmley Dakota sired two-horned February twin out of a Gobaith ewe while the second, of similar age, was a two-horner by Gowanbank Lacky out of a Gronant ewe. The Trumpers also won the ewe lamb class with a February two-horner by Llwyn Cammerro Martin and out of the same Gronant ewe which produced their second prize shearling. It made 220gns to the Carpenter Family, Stourport on Severn, Worcestershire. 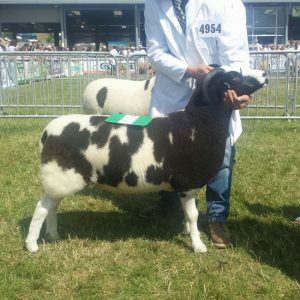 Messrs Trumper had third prize in the same class with a Nutwood Spartan sired March lamb out of a Llwyn ewe and took 180gns for this one – also selling to the Carpenters. 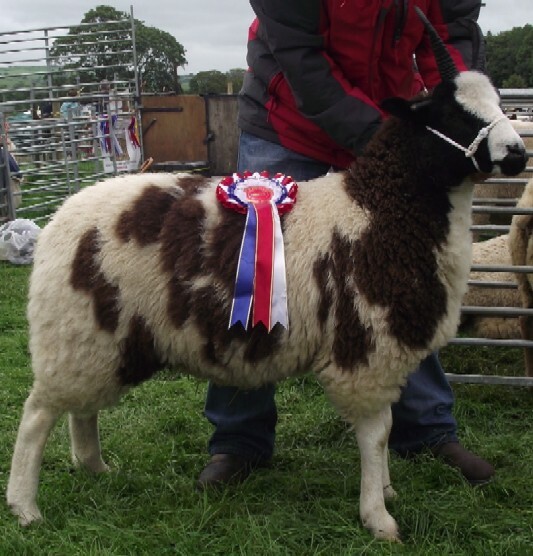 But second prize in this class – and also selling at 180gns – was Arwel Jones’s Llanfynydd) February two-horner by Myrddin Glyn and out of one of his own Celtic ewe that was Blackwolds sired. Buyer was G. Heaven, Gloucester. 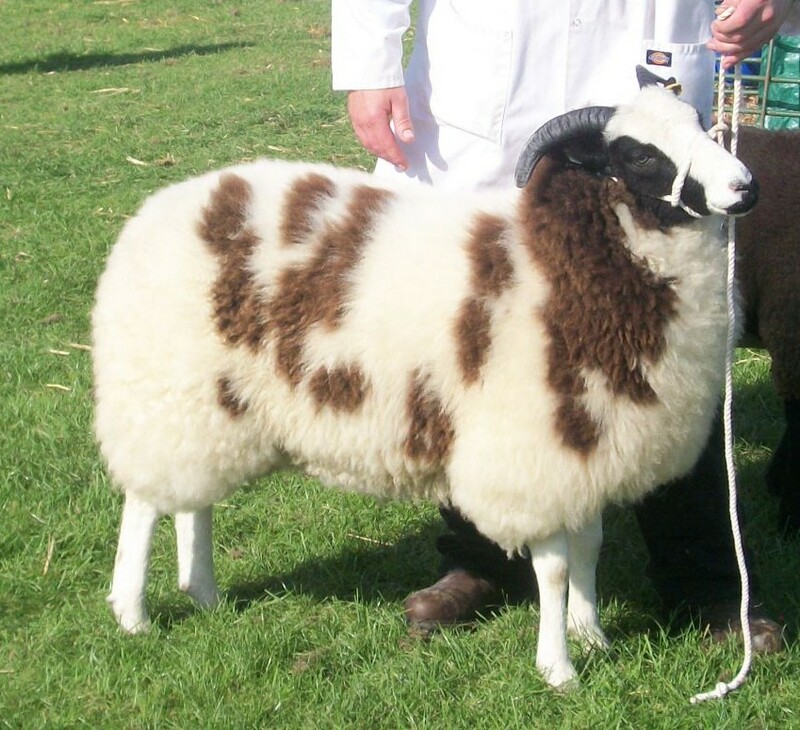 There was only one ewe forward, a 2011 two-horner from Arwel Jones’s Celtic flock. 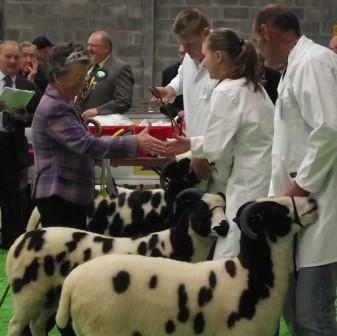 Having been a successful show lamb, the Dalewode Oliver sired ewe made 220gns to new member M. Wynn, Llandeilo. Senior rams topped at 350gns for Owain Jenkins’ (Kilgetty, Pembs) January 2011 two-horner Grove Farm Apollo bred by Mr & Mrs T Barker. It sold to Messrs Lewis, Llanddeiniol, N. Wales. 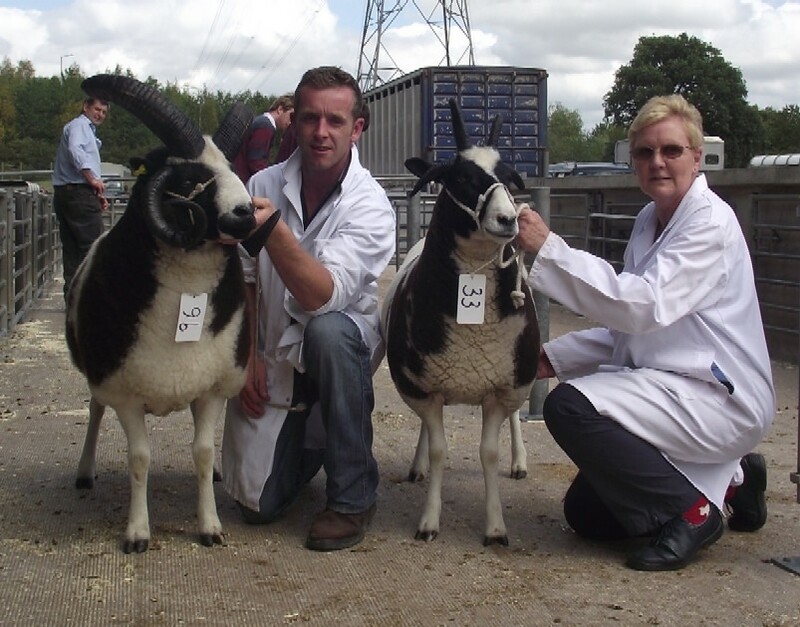 From Solsbury and Needwood breeding it had stood second in class to Delyth Davies’ (Llanwrda) Hope Dingaling, a Harries-bred 2011 two horner that went on to make 100gns. Averages: Ewe £231; shearlings £343; ewe lambs £104; rams £203; ram lambs £224. 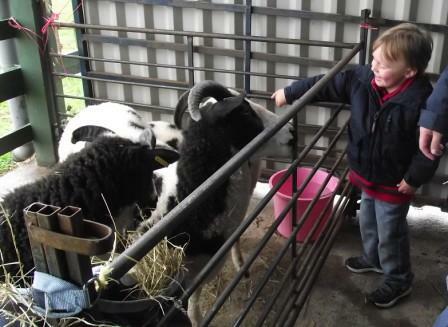 Recently at Cardiff Castle, the Cardiff Country Fair invited the Region to take Jacob Sheep to the event, they held an event to showcase the essence of rural Wales, celebrating the best of f.arming, food and the countryside. 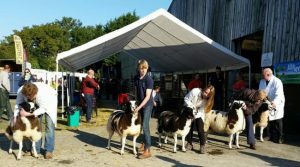 With farm animals, talks and cookery demonstrations produce and handicraft competitions, a Best of British produce market, country games and crafts, great food and drink it was a great day out for all the whole family. Thank you to Viv and Family for attending the event. 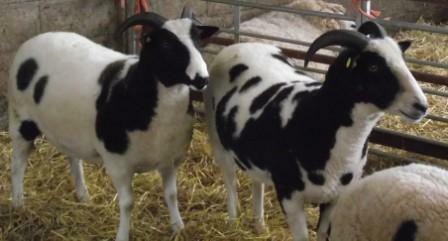 Recently Held was the Spring Festival Show , with sheep numbers reaching it’s highest yet. We had a great turn out of Jacob Sheep and Exhibitors. 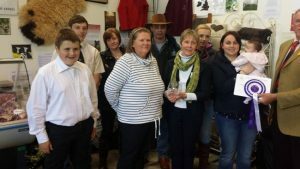 Mrs Lesley Partridge Judged the Jacob’s this year, She awarded her Champion to Wyn and Siwan Harries two Year Old ram and Reserve Champion Went to Shearing Ram from Rhodri Jones. Brenda Howell is still running Woolcup wales for the region, Entries for Woolcup 2014 is needed to represent Wales , First three items go on to represent Wales at the National in April 2014. Entries needed by the very latest end January. Please contact Brenda for more information on 01239810657 or e mail: brenda@owlscote.com. Chepstow Reserve Champion a Ewe lamb From the Trumper Family. 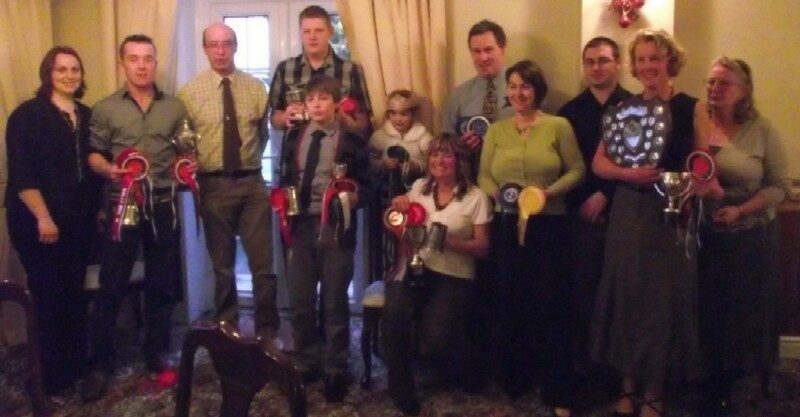 & Well done to Eddie Trumper Winning first prize in the Young Handler. 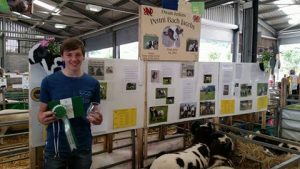 Results from the Royal Welsh Show. 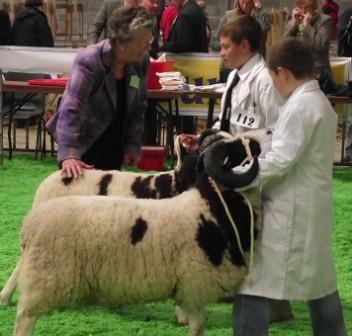 Champion of the Jacob Section RF Price of the Pentre Flock with a shearling ewe. The Leonard Family came out top winning the trophy for Best Wales Sheppard exhibitor showing at the Royal Welsh. 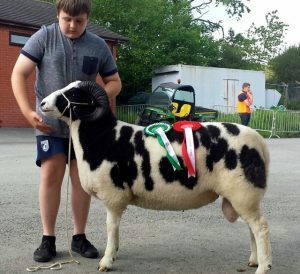 Winning third prize in the Royal Welsh young handler competition in a class of 50 exhibitors was Kieran Owen, Jean and Robert Price’s grandson, With Pentrenant Stella a Jacob Ewe Lamb . 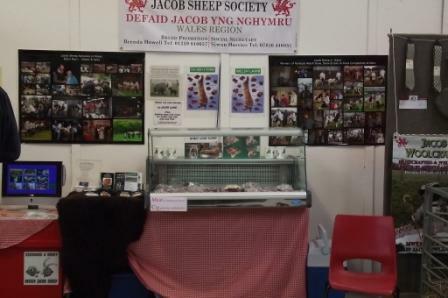 The Wales region represented the Jacob sheep society at the National Sheep association event, this year it was held in Wales, the event attracted over 9000 people, we had a pen of pedigree jacobs & a pen of commercial jacobs with cross bred lambs at foot on display. A good turn out of sheep were recently seen at the Spring Festival Show in Builth Wells.. 6 Exhibitors came and were judged By Mr Clive Richardson.. Clive Awarded His Champion of the Day to Robert Price of the Pentre Flock with a shearling ewe, and the second prize Shearling ewe who came in and was awarded the Reserve Champion,Owned by Rhodri Jones who joined the society last year A new Keen member for the Future. Also at the show the Jacob Wales Region were awarded ‘The Best Sheep breed tradestand award’ i I would like to thank all that were involved with setting up the stand and theire help over the weekend..
Robert Price (right) Champion and Rob Jones (left) with the reserve Champion. 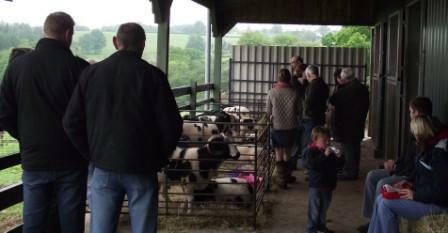 Wales recently held an open day at the Beiliau flock, owned by Lyndon Trumper and Family. 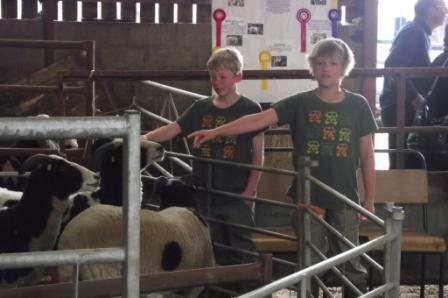 Lyndon has kept Jacob sheep for many many years, and now his children are keen to keep them going.. we had an excellent turnout of welsh region members with members coming from other regions aswell.. 30+ ewes’ were on view with his rams, . we also held an judging seminar where Jean Blacknell kindly gave her time to come and talk to the judges. An enjoyable day was had by all.. Many Thanks to The Richards family fro inviting us to their open day, we supported and Displayed our Jacob Stand there on the day . January 2013 saw the start of Lambing for some welsh flock, while others had their Ewe’s lambing later and were out in the snow we had recently. take a look at the pictures. December the 1st saw the annual gathering of Wales jacob members and friends, for a wonderful Christmas dinner and prize presentation day. 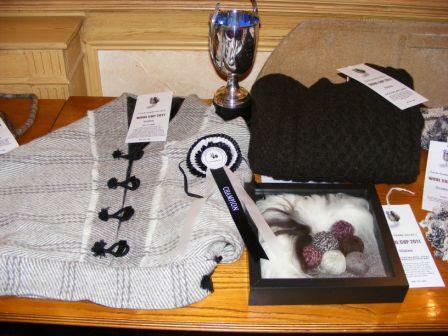 The flock Competition this year was judged by Lyndon Trumper and James Leonard , 10 flocks enterd Prize’s as Follows. 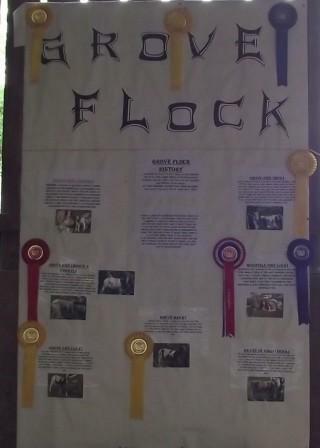 Wel done to all 10 flocks and many thanks to the judges for their time. 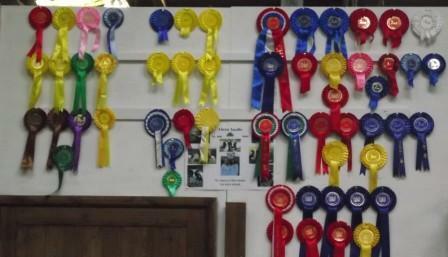 A successful day was recently held and the welsh region show and sale . 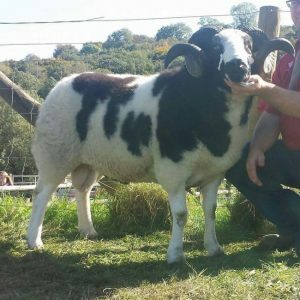 nearly a 100% clearance on stock sold… people came from far to buy Jacob sheep and were very happy with their purchase.. Mr John Emberton kindly travelled down to judge the show for us, with a good ewe lamb class put in front of him. The overall champion was presented to Arwel Jones’s Celtic Yearling Ewe, and the Reserve Champion went to Lyn Jones ‘s Scithwen Ewe lamb. Some Overall good prices, Top Price of the day went to Arwel’s Celtic Fantastic Ram Lamb who sold for 420gns to Bridget Wilson who has moved to the Welsh Region, another top Price went to Arwel’s Yearling ewe, who made 320gns to Wales member Ross Rixon, Top price ewe Lamb went to a Hope ewe Lamb from Wyn and Siwan harries Hope flock , at a price of 210gns to the Clover Flock in Wales. 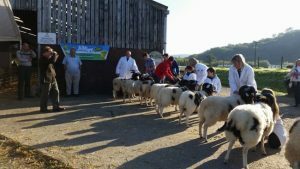 A recent Open day was held at Ross and Julian Rixon farm, numerous members turned out for the open day, a real warm sunny day we had in Wales which is quite rare. Many thanks to all who helped and travelled down for the day. James Leonard presents Brenda Howell a Champagne gift set on behalf of the Welsh region as Brenda has now ‘Retired’ from her duties as breed promotion person for Wales. Brenda had work hard over the years, we all thank her very much. The welsh committee we thought it would be nice to present her with a gift that she could keep. So it was decided to get the glasses engraved as seen in picture above. A successful Royal welsh has been and gone, despite all the wet weather we have had over the past few months, the sun shine came out on time for the royal welsh show 2012. Results as follows. 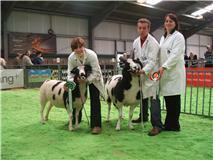 Owain’s Winning Group of Three, he also went on to win Reserve interbreed with his Jacob Group. Many Congratulations to James Leonard Grove Flock, James is an active member of Wales Region Committee.and Won the Pat Bromley Award for 2012 .James attends all meetings despite the very long journey, Being based in SE Wales he is the committee rep in that area, welcoming new members, visiting and encouraging members in SE.James helps at all events, contibutes to the work on the stand and is an excellent young ambassador for the Society, He has hosted an open day for the region and provided sheep and venue for a judging seminar,He continues to breed excellent stock and is always willing to have visitors to his stock to teach them about Jacobs……..
Our Annual Winter Social and Prize Presentation was held at the white hart Llandeilo.we all gathered for a Carvery Lunch. 40 members friends and Families joined in the occasion. This year competition was judged by Mark wakelin from wales and karl gill from ireland. they had a very busy two days looking at 11 different flock’s. 1st caroline lewis, 2nd s harries, 3rd viv martin, 4th arwel jones. At the recent Sale ,allthough numbers were a bit low, we had a good clearance on all Stock.Judge of the Day was Robert Locker From Scotland, He Awarded his Champion to a January born Ram lamb, Hope Dingaling from Wyn & Siwan Harries Hope Flock, The Ram lamb went on to make Top price of the Jacob Section and Joint Top price of the Market Whole Coloured Breeds Sale of £800.Robert Awarded his reserve champion to A late march born ewe lamb from rachel latter of pencw flock. she was top price ewe lamb at £190. 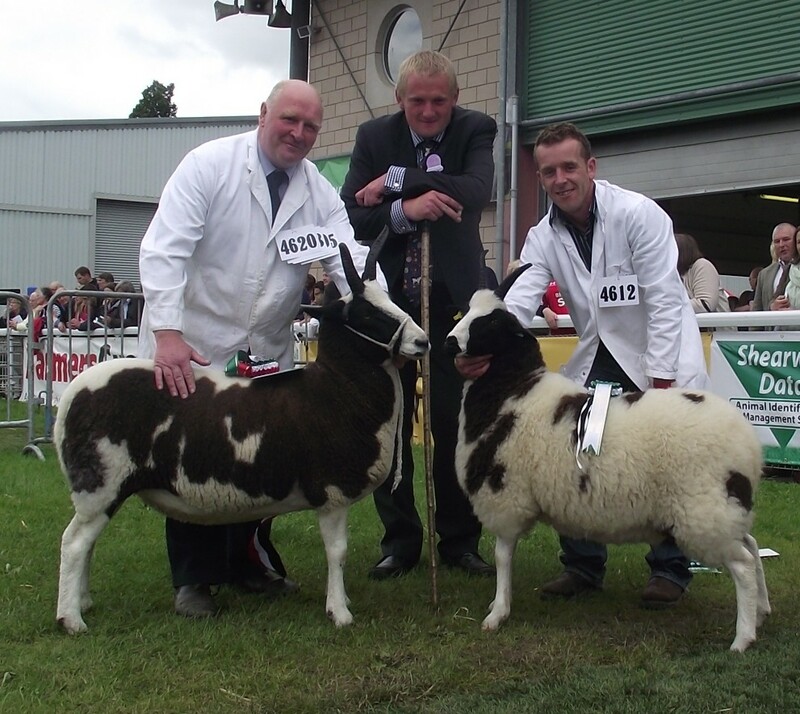 Pictured above, Wyn Harries With The Champion ram lamb hope dingaling (left) Rachel Latter With reserve champion Pencw ewe lamb (centre) and on the right robert Locker the judge. 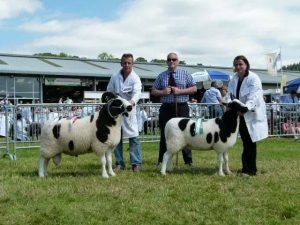 Champion went to Robert Price of the Pentre Flock With an aged Ewe And Reserve went to Wyn and Siwan of the Hope Flock with a Ewe Lamb. Pictured above With the Judge Stephen Dodsworth. With many breed stands on show this year and the competition getting hotter, it was of course an honour to win the Best Sheep Breed Stand. 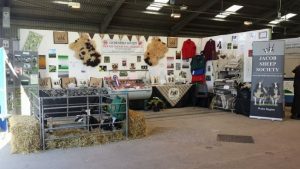 Brenda and Derrick Worked hard on Friday to prepare the stand ,with Jacob sheep on display ,and different wool blankets, and sheep skin rugs to ties and woollen hats and a TV with sheep and Shepard photos slide show, Brenda spinning, and also fresh Jacob meat, it all looked fantastic. Saturday came and judging was in progress from 9am. So an early start for Both Brenda and Derrick. By 2.15pm it was announced that the stand had won. 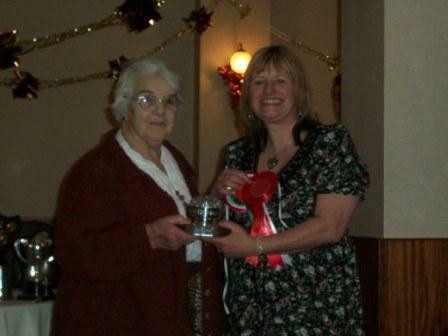 A lovely Glass bowl and a nice Purple Rosette was handed to Brenda. Thanks to Brenda and Derrick and to all other members and family’s for spending time on the stand aswell. Ewe Two Year old and over. 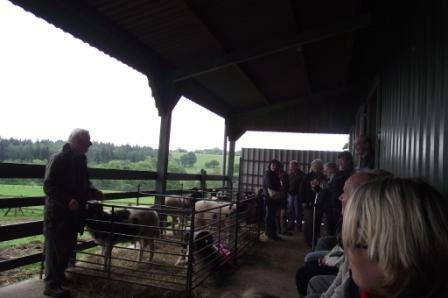 A very Lovely day was held at the Wales open day, some 40 members friend and family attended during the day. The day started at home of Viv Martin Llwyn flock, having been Reserve Small Flock in the Flock Competition. 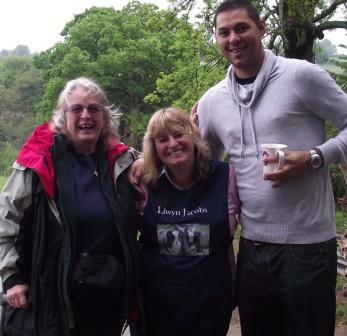 We were greeted by many of Viv’s family and friends where plenty of tee’s and coffee and biscuits were available. for us all to enjoy. Its was great to see the Jacob sheep society President with us Stan Taylor. The sheep were all housed indoors due to the weather, following the flock visit we then moved onto the village hall for lunch, and a Wales Agm and meeting. 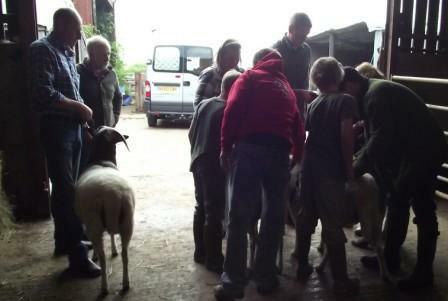 We all then moved onto visit James Leonard Grove Flock. 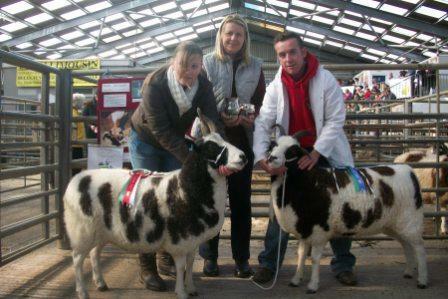 Having won the large flock in the Flock competition. Again we were greeted by James ‘s family who made all of us very welcome. 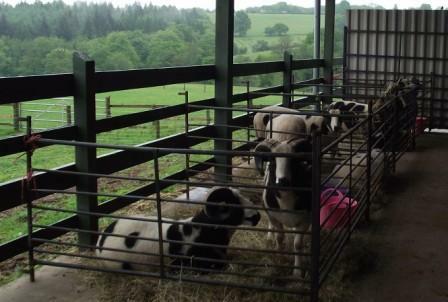 James’ Jacobs and his newly established flock of Galloway sheep were on view . During the afternoon, Wales ‘S Field officer Mark Wakelin Held a judging seminar. Which give experienced and non experienced Shepherd’s a refresh on judging . we were presented a line up of shearling ewes. It then went onto a full discussion between the members, and how they would place them…. Then a talk was given from a jss member and a friend to the Leonard’s family, the day finished back at Viv’s House where Chris Viv’s Husband did a great job cooking us all a nice BBQ …..Many Thanks goes two both families for making it such a wonderful day..
whilst entries are not needed until January 2012,NOW is the time to start thinking about it! 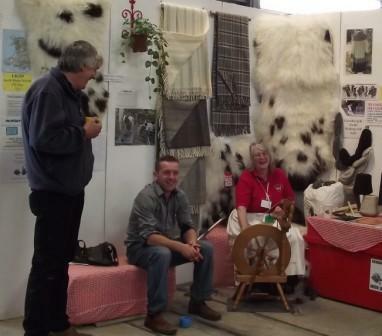 select a good fleece, felt it, spin it ect and make something to enter in the wool cup please! if you want advice or help contact brenda@owlscote.com , she will be very happy to help beginners and more experienced crafty people. A lovely Prize presentation and Cavery lunch was organized on the 5th December at the white hart llandeilo where 45 members friends & family gatherd. Then following the lunch, the flock competition results were announced. A total of 13 flocks were judged by wyn and siwan harries, where they kindly gave up a few weekends to go around judging all the flocks. Click here for results. Young handler prize went to Rhys Ffrancis. Second went to owen jenkins (below). Pictured (below) are the Banning Family New members to wales region. 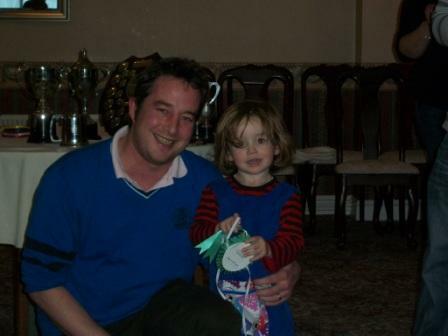 This is lily taking home their first rosette in the competition a 4th prize for the best ewe lamb competition. 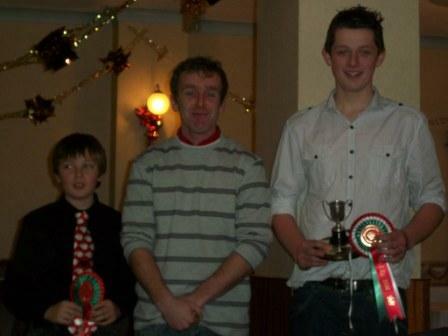 Richard Broad (below) receives the first prize for the best ewe lamb in wales. 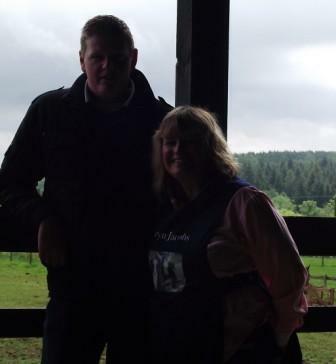 Wyn presents the award to Rhys Francis (below) who won the large flock and to Brenda Howell who came reserve. 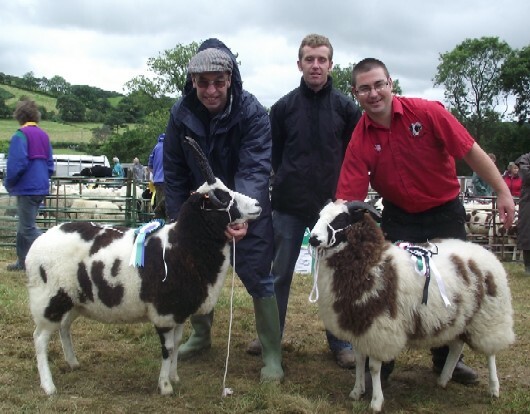 The Wales region held a Jacob sheep sale at Llandovery market on the 26th September 2010. There was a show followed by a sale. Show was Kindly juged by Lesley Patrirge. A Very good Clerance over all on the day. 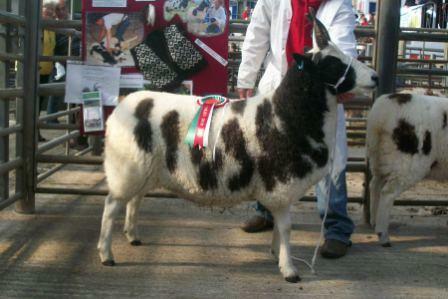 Pictured is the Champion Ewe from the Hope Flock, a Homebred 5year old ewe, which achived the sale Top Price of 410 gns . We all met at the home of Arwel Jones’s Celtic flock at 10.30 am for Tea Coffee and Biscuits at this was then followed by a flock visit of the Jacob sheep together with a drive around their pedigree herd of Simmental Cattle. Following the farm walk lunch was held at the Penybont Llnafynydd where we all gather for a lovely meal; this was then followed by the Wales AGM. 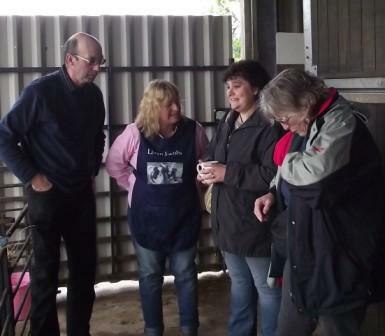 Many thanks to Arwel & Family for organising the Open Day. A very Successful Royal Welsh Was held this year. The judge was Gordon Connor from Scotland. 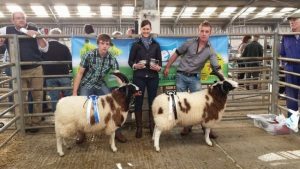 The Overall championship went Wyn & Siwan with a homebred Shearling Ram Hope Rocky and the Reserve Champion went to the Philips family winning with a homebred Shearling Ewe. Wyn Harries With Champion Hope Rocky. Left, Cherie Philips Right With her Shearling ewe, Champion Group Went to The Hope flock Yet Again with Hope trio. Monmouth show- judge Bridget Wilson.